French energy storage system maker Electro Power Systems (EPS) has announced the successful delivery of the storage system sired to the Coober Pedy Renewable Hybrid Power Project’s microgrid in Coober Pedy, South Australia. This innovative Project, owned by integrated energy company Energy Developments, involves a hybrid combination of 4 MW wind, 1 MW solar, a 1 MW / 250kWh battery and various other enabling and integration technologies to provide the town of Coober Pedy with approximately 70% renewable energy over the 20 year life of the Project. The Project will be integrated with EDL’s existing 3.9 MW diesel power station and result in a commensurate reduction in annual diesel consumption. Nicola Vaninetti, Vice President of EPS, said the arrival at the destination marked the official start of the installation and commissioning phase of the project, granted to a company part of the Toshiba Group and developed in partnership with EPS. 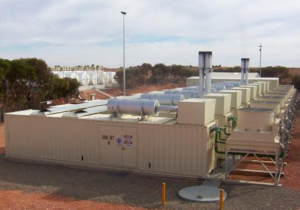 He said the microgrid energy output will be underpinned by a 20-year Power Purchase Agreement with the District Council of Coober Pedy and supported by the Australian Government. “Development of this project in a remote location with extreme climatic characteristics such as Coober Pedy, located in a desert area about 850 kilometres in the north of Adelaide, highlights the applicability of EPS technology even in the most challenging environmental conditions”, Mr Vaninetti remarked. The Coober Pedy hybrid power plant, which received $18.4 million funding support from ARENA, is expected to be commissioned in the first half of 2017.